Happy Game Day! If you didn’t already know, I live in the overly-hot state of Alabama. Down here, people live and breathe college football- most of the SEC states do. And in Alabama, you choose between Alabama and Auburn (though there’s always the random few that will cheer for a neighboring SEC team). A good chunk of the country hates us- our state boasts the last 3 consecutive National Champions (Alabama, Auburn, Alabama) and the SEC overall has held the title for 6 years. I’m not originally from Alabama- I moved here just in time for college. So my pro-football loyalties lie with the Steelers, since I was born and raised in Pittsburgh. You may see a post for them at some point in the future. Never fear though, this isn’t a regular thing- it’ll just be one each during the regular season. If you’re interested in WHY I chose the specific colors and prints (I’ve had people from outside of the SEC/Alabama are inquire about houndstooth), just keep reading after the nail photos. If you don’t care, then you can stop after the nails! For this look, I opted to do my first ever accent nail! I’m not really a huge fan of accent nails, but I think it worked this time. I started off with a coat of Sinful Colors Slate on all but my index finger, and painted my index finger with Sinful Colors Snow Me White. Then, I topped off each grey finger with 2 coats of Jindie Nails Crimson Pride– a glitter topcoat inspired by Alabama Football, filled with various shapes and sizes of red and white glitter as well as silver shimmer. Finally, I pulled out my stamping plates, and used the houndstooth print on Cheeky’s CH8 from their spring collection on my index finger. Now, for the ‘why’ of all the colors. For the grey- you may have noticed the first photo in this post, our mascot the elephant posing the the big red A. Our mascot is Big Al, an elephant- so grey is for him! Don’t ask me why an elephant, I’m not even sure Alabama itself knows the REAL reason. There’s a few rumors- one involves the team running out and sounding like a herd of elephants. You can find Jindie Nails here– she offers other football colors if you aren’t cool enough to cheer for Alabama (I kid! I kid! <3), among a lot of other awesome colors. Be sure to check back early next week- I have a big review coming on Jindie Nails! Cheeky stamping plates can be found on Amazon here– they’re very affordable and there’s a ton of great designs! You can see my other stamping post using a Cheeky plate here. This entry was posted on September 22, 2012 by The Polish Monster. It was filed under Uncategorized and was tagged with football, glitter, houndstooth, indie, Jindie Nails, stamping. I have a special resentment against Auburn. But that’s only because they won the BCS in 2010 over my Oregon Ducks. I’m Pac-12 all the way, hate the SEC but I think your mani turned out great! Haha, yeah I think most people outside of the SEC hate the SEC 😉 I also hate Auburn though! First of all, ROLL TIDE! I live in northeast Alabama and love my college football!I love your nails! I did my game day nails like your accent nail, only on all of them. Oh! I love accent nails! I am always so traditional and serious with most things in life that crazy accent nails are my way of revealing the “fun” side of me! 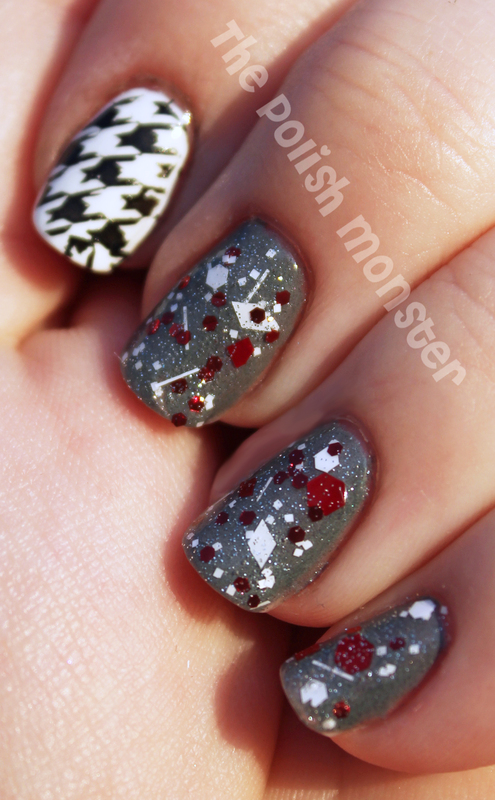 Love your school pride mani and I think your accent nail is a perfect touch!